In order to accommodate the hordes of new patients entering the hospital, Bon Secours St. Mary’s Hospital in Richmond, Virginia underwent a transformation in which the medical facility was expanded upon. Architects at Odell took up the challenge of designing the facility’s new additions, which included a front entrance that featured an aluminum composite canopy. The curved canopy proved to be a challenge for fabricators Roof Services Corporation; however, it turned out beautifully in the end. The Mica Champagne panels from ALPOLIC perfectly complemented the hospital’s brick facade, helping to create an environment of warmth and comfort for patients. ALPOLIC’s aluminum composite panels are enriched with Lumiflon FEVE resin technology. Originally developed in the 1980’s, Lumiflon FEVE resin has been featured on countless architectural surfaces for over two decades. The ultra-durable resin offers architectural surfaces coatings that come in a wide range of gloss and color. With the help of Lumiflon FEVE resin, the structural integrity of the coatings remain in pristine condition for an extended period of time. Additionally, Lumiflon helps to lower lifespan costs of a coating, as the high performance formulas eliminate the need to recoat. Coatings that are fortified with Lumiflon FEVE resin technology offer architectural coatings superior color and gloss retention in addition to excellent weatherability, allowing the coating to withstand the pressures of UV radiation, water, salt, and other elemental deterrents. 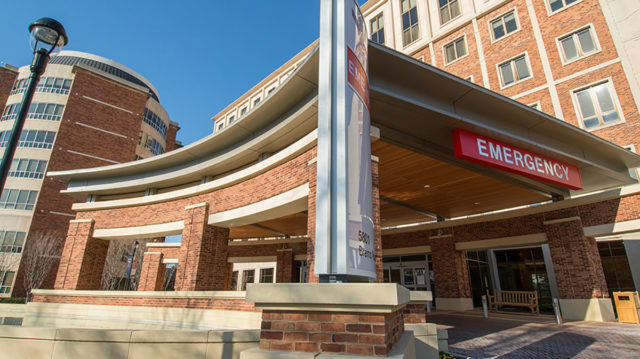 The Lumiflon-based coating system proves itself most beneficial for buildings that are heavily used like the Bon Secours Saint Mary’s Hospital.